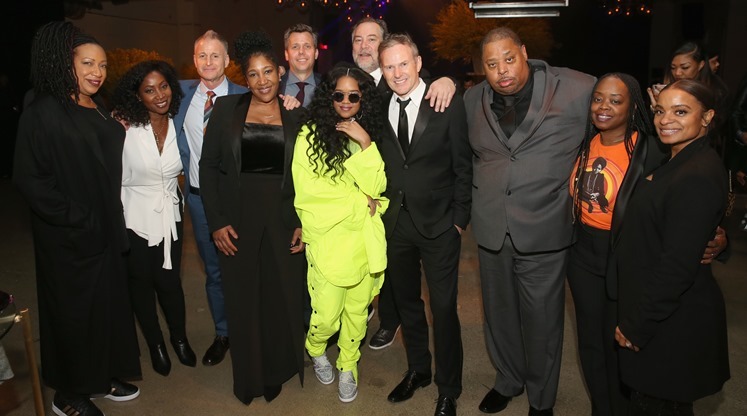 At Sony's Post-Grammy reception, RCA Grammy winner H.E.R. celebrates her win and breakout performance with her team, including Nipper Boss Peter Edge, who discovered her when she was a mere adolescent. Later, Co-Presidents John Fleckenstein and Joe Riccitelli lobbied to be referred to by the moniker T.H.O.S.E.G.U.Y.S. Seen feeling proactive about pronouns are (l-r) RCA EVP Marketing Carolyn Williams, EVP Creative Content Camille Yorrick, President of A&R Keith Naftaly, MBK Entertainment's Jeanine McLean, Fleck, H.E.R., Riccitelli, Edge, MBK's Jeff Robinson, RCA SVP PR Theola Borden and MBK's Misha Mayes.